I still have many more stories from our recent Bavarian travels to write about, but for this week’s post we’re heading back across the Channel to London to share some reminiscences from the few days we spent there earlier on in our trip. Our younger daughter, Mlle, has been living in London since last year and she was keen to show us round her local haunts and some of her favourite London places. Amazingly we had been to very few of them, despite living and working in London for 9 years ourselves! Our old stomping grounds were the suburbs to the north of the centre such as Camden, Wood Green and East Finchley where we lived at various times. I always loved heading over to Hampstead for a browse round the upmarket and rather expensive shops or hanging out at one of the Highgate Hill cafes. Of course with its many attractions we knew Central London well. However Notting Hill had a less than salubrious reputation when we lived in the metropolis, so I was hesitant to venture out that way – my knowledge until recently was confined to the Hugh Grant/Julia Roberts movie of the same name. Notting Hill however is not too far from Mlle’s new base and so we headed off there one Saturday morning to take a look round. First stop a delicious late breakfast/brunch at an adorable eatery, The Wildflower Cafe, which has become one of Mlle’s favourite venues. The Wildflower Cafe, as its name would suggest, is actually a florist and restaurant combined and serves fresh organic produce. A favourite amongst locals, it is the sort of place you need to hear about through word of mouth. Somewhere between Ladbroke Grove and Westbourne Park, the Wildflower is tucked away along Chepstow Road W2. We arrived by a slightly circuitous route due to tube station closures, where we took a wrong turn into a housing estate (Mlle was using a phone app, which seemed to want to go as the “crow flies”!). We also had a few stressful moments trying to cross the busy thoroughfare Westway! You can’t miss the Wildflower though once you turn into Chepstow Road – the cheery lilac exterior brightens up the row of typical London terraced buildings. 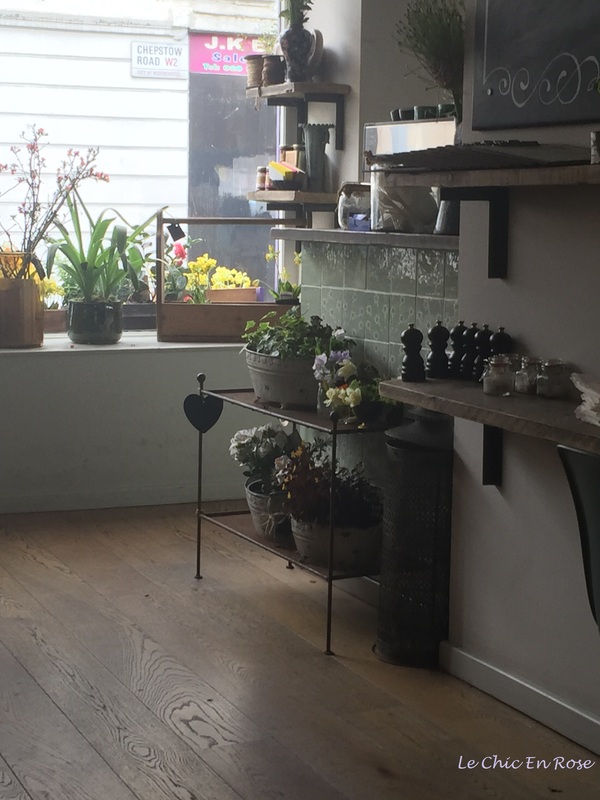 Inside, the floral theme continues and you dine amongst pots of beautiful flowers in a setting that is cosy and rustic, yet hip and trendy at the same time! 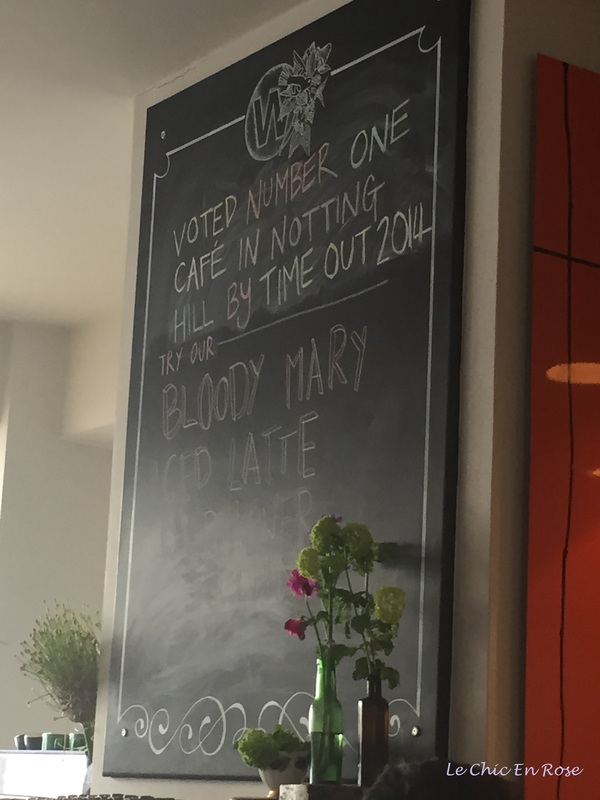 The Wildflower is proud to have been named number one cafe in Notting Hill by Time Out magazine readers in 2014! The food and presentation certainly merits the accolades! We tucked into scrumptious poached eggs on rye toast with avocado, truss tomatoes, wilted greens, mushrooms and organic fruit juices – it all tasted wonderful and as a tea connoisseur I especially enjoyed the green tea blend. Of course they serve plenty of coffees too and Monsieur got his long macchiato just to his liking without having to explain it to the waitress so he was duly happy! Mug of green tea – delicious! The dishes are all served with a floral twist too! Not surprisingly the Wildflower is extremely popular and bookings are essential. It still retains a lovely homely feel – we were pleasantly surprised to see a couple with their canine companion sitting at the table next to us – no way can you take a dog into a cafe in our neck of the woods back home in Perth (unless it’s a guide dog)! We’ve always liked the way continental Europeans are so relaxed about allowing doggy companions into restaurants and hotels and it looks as as though that influence is now coming into London cafe life too. 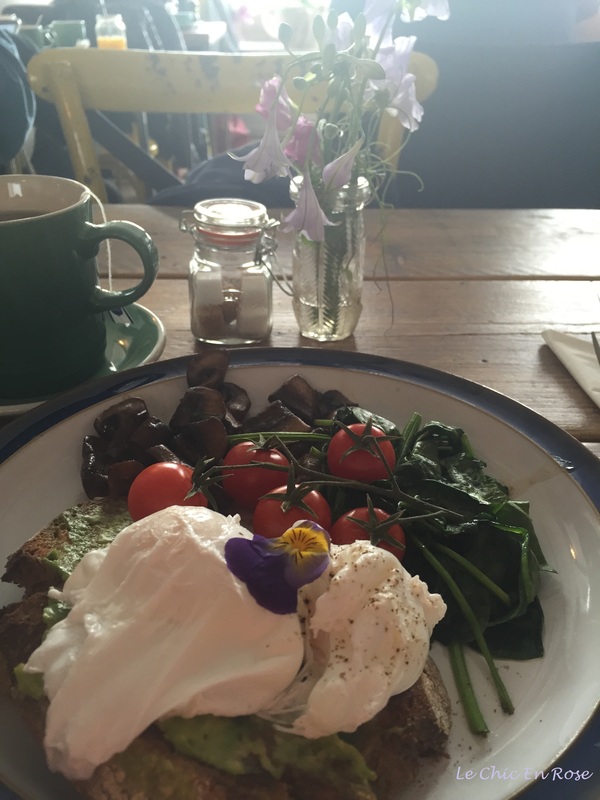 If you’re visiting London the Wildflower Cafe is well worth checking out. Next week we’ll go exploring more of Notting Hill with Mlle! Oh, wow!! I’d love to visit this spot! It looks wonderful (and I love the pansy on the delicious looking plate!). I can’t wait to get back to the UK. My first impressions were wonderful. I’d love to visit this quaint little spot. Thanks for sharing! I’ve never been to Notting Hill Rosemary in all my London visits – seen the movie too though!! The Wildflower Cafe looks absolutely adorable and the food is mouth watering in your pictures. Your daughter is lucky to have a place like that as a local haunt – think if it was near to me I’d never be out of it!! Looking forward to reading about the markets Rosemary – I’m already getting lots of ideas for a next London trip!! That’s great to hear Joy – part of the reason I wanted to do some London posts was that we went to some places I wouldn’t normally go to because our daughter is now a local! It was interesting to see London through her eyes and get a feel for how London has changed since we lived there. The markets were amazing too – I could have stayed all day!! I read mysteries by Deborah Crombie and they’re set in this part of London–all the place names sound familiar! I hadn’t come across her books before Kerry so I’ve just googled them and they sound fascinating and right up my street! Apparently they are well known too for the maps and illustrations and I see she set some of her books in Notting Hill! Try them! I really like them a lot. it’s a series, with main characters that are very appealing. It’s probably worthwhile to go back and start with the earlier books, so you get a sense of character development. And, yes, the maps are charming! Thanks for the tips Kerry – always love a good crime novel! Looks like a really nice places with delicius food! These pictures got me hungry…. Oh now, it is not too early to enjoy this breakfast! Looks delicious. I love finding little cafés like this where the food is great and the ambience perfect. It certainly helps to have a ‘local’ to show you around. I love visiting my son in Australia as he usually takes me to little places like this, although now he has moved to Perth I guess he is still in the process of discovering them for himself. Well yes I am hoping for at least one visit there! Though I think they will probably only be in Perth for a couple of years – it is a stepping stone on the career ladder, and knowing my son, he could jump off at any minute! I think they’ll end up in New Zealand eventually (partner’s family live there) once little man starts school. I have been south (though it wasn’t the best of weather at the time) but I’d like to go north and also see the spring flowers up there. Timing has to be right for that, but given your high temps last summer I think I should avoid the summer months! High 30s and 40 degrees would finish me off! I like it around 25 at the max. And not humid. Humidity makes me bloat and feel uncomfortable. It was a lot more humid in Sydney when I was there in November than I remembered from previous visits. Is it humid in Perth? Sounds like my kind of place. Sigh. I shall definitely have to make plans to visit next year.